PEROU – Lambayeque - Northern Peru is a veritable treasure trove of archaeological wonders. Now, archaeologists and medical doctors are planning to work together to study discoveries from a new perspective: DNA. Andina news agency reports that officials in the Regional Hospital of Lambayeque have been approached by archaeological researchers working at dig sites in the area with an interesting proposal. According to Andina, archaeologists want to work with the hospital in order to perform genetic testing on human remains found at excavations. Hospital director Victor Linares told Andina that “Representatives of the Bruning Museum of Lambayeque have approached us about the possibility of doing some genetic studies in alliance with the hospital, on prehispanic remains found in this area.” According to Andina, genetics specialists from the Bruning Museum would work with hospital staff in order to perform research as well as capacitate them in the proper methods for handling and testing of archaeological remains. “The idea would be to reach an agreement that allows us to provide a wide-ranging collaboration in the genetic research performed on remains discovered in archaeological sites in Lambayeque,” Linares told Andina. The hospital is also home to a microbiology lab and a spectrophotometer that could help researchers better understand the chemicals present in human remains found in the area, Andina writes. TURQUIE – Kastamonu / Pompeiopolis - Professor Latife Summerer, who has left her mission at Germany’s Munich University and moved to Turkey, has been heading the excavations in the ancient city of Pompeipolis for seven years. The ancient city is located in the Black Sea province of Kastamonu. Excavations are ongoing on the Zımbıllı Hill of the ancient city of Pompeiopolis, which is regarded as similar to the Ephesus and Zeugma ancient cities. Summerer left her mission at Munich University two years ago to focus on excavations and began working for the Kastamonu University. Summerer said that Pompeiopolis was one of the seven cities founded by Roman general Pompeus Magnus in the Pontus and Paphlagonia region. Summerer said that the works in Pompeiopolis were the only scientific excavation in northern Anatolia, adding that it was a long-term excavation project. She said that they were examining the pieces unearthed during the excavations using the best methods, and added, “In the future, this excavation will be shown as a reference point for other findings. This is of course a very important step both for Kastamonu and the northern Anatolian region.” The ancient city of Pompeiopolis was discovered by Pascal T. Fourcade, French consul from 1802 to 1812. It has been claimed by American and European archaeologists that the ancient city is wealthier and larger than the ancient city of Ephesus in İzmir. USA – Keyhole Reservoir - People have been camping near Keyhole Reservoir for thousands of years. Long before pop-up campers and pontoon boats descended upon the reservoir on Labor Day, Native Americans, European traders and homesteaders looking for a new life set up camp near the Belle Fourche River along what would in 1952 become the shoreline of Keyhole. Severe droughts in the 1930s and the nation's increased energy needs created an explosion of dam construction. Public concern for the potential loss of the cultural resources in the areas flooded by the creation of the dams prompted the Smithsonian Institution to create the River Basin Surveys project in 1945 to conduct surveys to identify cultural resources, and excavate what they thought were the most significant and most threatened sites. "Usually, you have to go out and determine whether there is stuff there or not. 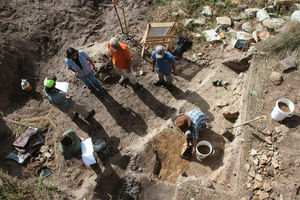 This site was different, it was already known," Hare said referencing previous work done by the River Basin Surveys project in 1948, and limited excavations done by the University of Wyoming in 1985. That work suggests that at least part of the Catclaw site was occupied between 280-460 AD. The SWCA team excavated three prehistoric rock-filled fire pits at the Catclaw site and found signs, such as tepee rings, indicating that the site extended away from the shoreline. Artifacts such as arrowheads were collected for further research and curation. The Stocks Millar Homestead site is one of only a few historic ranches deemed significant for listing on the National Register of Historic Places near the reservoir, and university researchers determined that it was occupied between the 1800s and 1950s. At the homestead, the team excavated a historic trash dump that contained bottles, children's plates and toys, a pocket watch, decorative glass figurines of a crocodile and a bull dog, can fragments, Prince Albert-style standing tobacco tins, marbles, safety pins, old battery cores, horse shoes, saddle tack, cowboy and children's boot soles and fragments. And there were lots of bones from different animals. BULGARIE – Sveshtari - At Sveshtari, near Razgrad, the team led by professor Diana Gergova has found the remains of a two-wheel chariot, buried with two horses still in their harness. Each horse was buried in its own sarcophagus. Gergova described the find as unique for Bulgaria, the first physical evidence confirming some of the historical theories about Thracian culture. A mural of a two-wheel chariot has been previously found in a burial mound near Kazanluk, but the two chariots previously found by Bulgarian archaeologists both had four wheels, she said. Gergova said that it was too early to draw conclusions about the burial site, but said it was likely evidence of the burial rites practices by Getae tribes. She estimated that the burial dated back to the third or fourth century BCE. 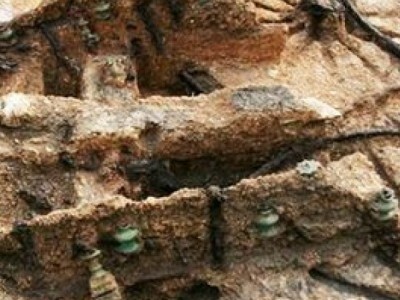 This was the second year Gergova’s team has carried out digs at Sveshtari, a site that remains largely unexplored – although it does carry signs of having been raided by treasure hunters fairly recently, as the team found a plastic mineral water bottle from 2001, judging by its label. A distinctive feature of the Sveshtari site is that the dozens of burials follow the pattern of the constellation Orion. Balei - Near the village of Balei, in Vidin district, archaeologists led by Georgi Ivanov and Tanya Hristova, continued to excavate the necropolis of a settlement dating back to the middle of the second millennium BCE. The settlement itself, which appears to have been inhabited between 1600 BCE and 1000 BCE, was found in 1970, but the necropolis was only discovered in 2010. This year’s digs focused on 16 separate burials, which yielded numerous items, including more than 50 undamaged ceramic vessels, stone and bone tools, as well as bronze decorations. Suvorovo - Even older is the site near Suvorovo, in Varna district, where archaeologists led by Vladimir Slavchev have been excavating a pottery workshop believed to be about 6500 years old. Although archaeologists have previously found the remains of ovens that could have been used to fire clay pots, the Suvorovo site is the first confirmed pottery workshop excavated in Bulgaria. 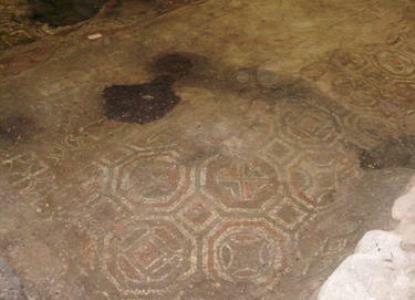 “The find of this workshop shows that there was specialised production during the middle stone and bronze ages. This means that we have people who are engaged exclusively in making a specific product, which means that the second division of labour has already happened,” Slavchev said, as quoted by Bulgarian National Television. The site belongs to the same Eneolithic (or Chalcholithic) culture that produced the Varna necropolis, which yielded some of the oldest golden jewellery in human history, dating back to the middle of the fifth millennium BCE. Pomorie - Another site that has seen extensive excavation this summer is near the town of Pomorie at the Black Sea coast. There, the team led by Sergei Torbatov has been focusing on the ruins of a Roman villa, believed to have belonged to one of the richest families in the town of Anchialos. Among the distinctive features of the manse, built at the beginning of the second century CE, are a unique mosaic, Persian ceramics, marble imported from quarries from the islands in the Sea of Marmara, as well as a well-stocked wine cellar with amphorae imported all the way from the Mediterranean Sea. Items found by the archaeologists include a Roman imperial trade seal from the fourth century CE, a bronze cross necklace from the 11th or 12th century, as well as a pewter seal of a guard captain.